The Park Authority has more than 23,000 acres of parkland in Fairfax County. Unfortunately, more than one-third is infested with non-native invasive species of plants and shrubs that cause ecological or economic harm. Non-native invasive species reduce tree cover, decrease water quality, increase erosion and litter and create more habitats for other invasive species. 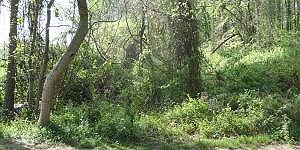 The more 300 invasive plant species in our area further degrade the natural resources by threatening native tree, shrub and understory species diversity, weighing down tree trunks and branches and creating impenetrable thickets that block out sunlight. Invasive species also diminish the quality of wildlife habitat and the outdoor recreation experience for residents, making parkland unattractive and uninviting. Each natural area in Fairfax County is valuable and these ecosystems should be healthy, native forests. While improving the natural resources and function of our watersheds, award winning Invasive Management Area (IMA) program works to build a citizen-based resource stewardship network. IMA volunteers restore habitat on parkland by removing invasive plants that are detrimental to the environment. Volunteers also plant native species that are needed by local wildlife and enhance the ecosystem services available in that park. The IMA program engages a large number of volunteers in small, reasonable-sized, neighborhood projects spread throughout the county. The program has restored 50 acres of valuable forest ecosystems in 40 local parks, utilized over 21,000 hours of volunteer service, removed tons of invasive vegetation and planted over 3,000 native trees, shrubs, flowers and grasses -- all in support of our mission to provide local hotspots of native biodiversity for human and wildlife enjoyment. Learn more about the IMA program. for their sponsorship of the Invasive Management Area program. Your donation helps the Park Authority to purchase more native species for re-planting, purchase more interactive boot brushes that help prevent the spread of invasive species, and engage more volunteers. Today’s stewardship helps ensure future environmental health!